MPs have voted by 413 to 202 - a majority of 211 - for Prime Minister Theresa May to ask the EU for a delay to Brexit. But some Labour frontbenchers resigned to defy party orders to abstain on a vote on holding another referendum. Shadow housing minister Yvonne Fovargue, shadow education minister Emma Lewell-Buck, shadow business minister Justin Madders, Ruth Smeeth, a shadow ministerial aide, and Labour whip Stephanie Peacock, all quit their roles to oppose one. She had been forced to offer MPs a vote on delaying Brexit after they rejected her withdrawal agreement by a large margin, for a second time, and then voted to reject a no-deal Brexit. She has warned that extending the departure date beyond three months could harm trust in democracy - and mean that the UK would have to take part in May's European Parliament elections. How did my MP vote on 14 March? Downing Street said the government was still preparing for a no-deal Brexit. Theresa May is planning to hold another "meaningful vote" on her withdrawal deal by Wednesday - after it was overwhelmingly rejected on two previous occasions. If she wins that vote, she will ask for a one-off extension to Brexit get the necessary legislation through Parliament at an EU summit on Thursday - if not she could ask for a longer extension. And it would be for the leaders of those states "to consider such a request, giving priority to the need to ensure the functioning of the EU institutions and taking into account the reasons for and duration of a possible extension". It is still technically possible that we could leave the EU at the end of this month - the law has not changed. But politically it is now almost entirely out of reach. The prime minister is accepting she will miss one of the biggest targets she has ever set herself. Tonight's vote is awkward for another reason, as it again displays the Conservatives' fundamental divisions. This is more than a quarrel among friends, but a party that is split down the middle on one of the most vital questions this administration has posed, with cabinet ministers, as well as backbench Brexiteers, lining up to disagree with Theresa May. Downing Street said this was a "natural consequence" of Mrs May's decision to offer a free vote on an issue where there are "strong views on all sides of the debate". Chief Secretary to the Treasury Liz Truss tweeted: "I voted against a delay to Brexit. As a delay was passed by Parliament, I want to see deal agreed ASAP so we can minimise to short, technical, extension." Seven cabinet ministers - Ms Truss, Brexit Secretary Stephen Barclay, International Trade Secretary Liam Fox, International Development Secretary Penny Mordaunt, Commons leader Andrea Leadsom, Transport Secretary Chris Grayling and Defence Secretary Gavin Williamson - voted against the government motion. 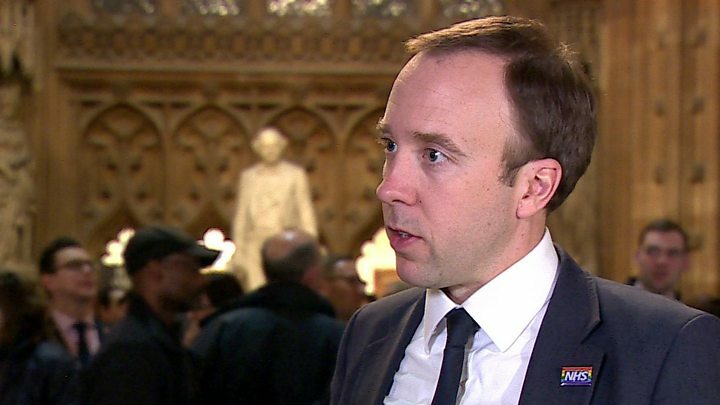 Media captionHealth Secretary Matthew Hancock said "it is still possible to deliver Brexit on the 29 March"
Health Secretary Matthew Hancock said it would be "extremely difficult" but "still possible to deliver Brexit on 29 March with a deal". He said there were now two options: "To vote for the deal and leave in orderly way or a long delay and I think that would be a disaster." 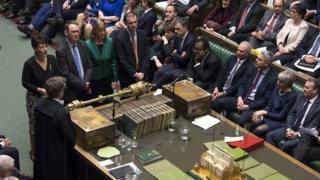 And they also rejected a cross-party plan to allow MPs to take control of the Brexit process to hold a series of votes on the next steps, by the narrow margin of two votes. 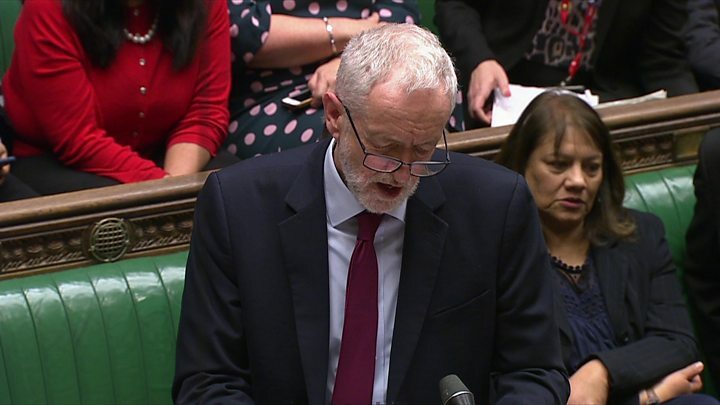 Media captionJeremy Corbyn: Public vote an "option to break deadlock"
He said: "Today I reiterate my conviction that a deal can be agreed based on our alternative plan that can command support across the House. "I also reiterate our support for a People's Vote - not as a political point-scoring exercise but as a realistic option to break the deadlock." Labour abstained when MPs voted on the referendum proposal, tabled by Independent Group MP Sarah Wollaston, arguing that now was not the right time to push for a public vote. But 17 Labour MPs defied party orders and voted to oppose another referendum - while 24 Labour MPs rebelled to vote in favour of one. Among frontbenchers to quit over the issue, Ms Peacock said: "It is with deep regret I tonight resigned from Labour's front bench, because I believe we should respect the result of the 2016 vote to leave the European Union." Labour's plan to delay Brexit to allow Parliamentary time for MPs to "find a majority for a different approach" was defeated by 318 to 302 votes.